In an age of accelerated innovation and conspicuous boredom, what better way to set out your pedagogical stall than by slipping your pins into the trousers of champions. 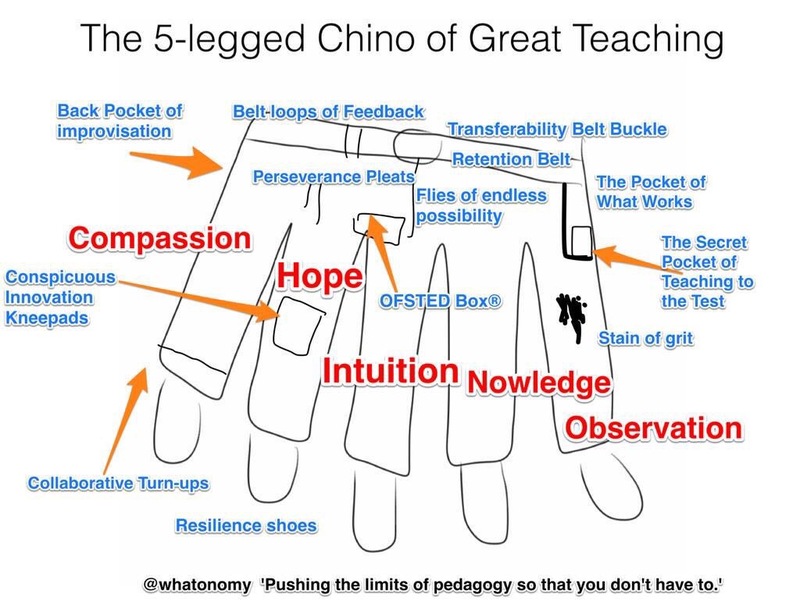 The 5-leggéd Chino of Great Teaching is nothing less than the sum of ALL HUMAN KNOWLEDGE of the best that has been thought and said [#bymickhucknall] on education, schooling, pedagogy, teaching, learning and making spice racks. Provoke the sartorial & professional envy of your peers by donning these bad boys. Haha. I wore my two-legged chinos for the first two Inset days. But then donned the more regulatory business trousers for the students’ arrival on Thursday. Perhaps I should alternate though, as my business trousers are not very compassionate.